The current price of KDDI EZ-appli BREW applications varies between JPY 100 to 500 each. Downloading a 600 kb application costs JPY 1,296 using packet communication. Using SophiaCompress(BREW) EARTH's average 67% compression rate, that 600kb application is now 200kb and so, costs one-third as much to download ( JPY 432). Triple the number of applications which can be stored in a handset with SophiaCompress(BREW) EARTH's average 67% compression rate. Rich-featured games such as Play Station Portable and Nintendo DS can be used with today's mobile phones. When migrating those games to BREW, the biggest problem is often size constraint. Manually delete unnecessary data or share data in the program. Do not implement all of the functions. 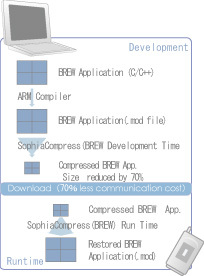 SophiaCompress(BREW) EARTH minimizes any kind of application to fit within the memory capacity of most handsets, while allowing all functions available.